Deacon Gerard Turnbull (retired) has kindly offered to visit the sick in St Paul’s parish to offer the Anointing of the Sick. 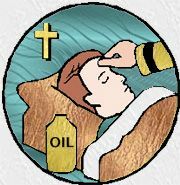 The anointing of the sick is administered to bring spiritual and even physical strength during an illness, perhaps for those near the time of death, but it is not the same as last rites. Holy anointing was instituted by Jesus Christ. It is alluded to by Mark, but is recommended to the faithful and promulgated by James the apostle and brother of the Lord. © 2017 St. Paul's Parish Poynton, All right reserved.